Boscia Clear Complexion Kit claims to give you superior and effective acne fighting results. They say that it will provide remarkable results, helping you to get a preservative-free approach to better skincare for even the most sensitive of skin.They say that Boscia Clear Complexion Kit will help you to improve the clarity, tone, and texture of problem skin by using the best botanical extracts. And using 4 separate products, the only question is, is the Boscia Clear Complexion Kit enough? 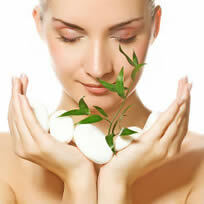 Kits typically have the potential to promote greater acne fighting results than a single product. Why? Because 4 pieces have the potential to provide a more comprehensive approach than one. A cleanser for example washes away dirt and oil that builds up throughout the day. But when complemented by a toner, which shrinks pores and tones the skin, it provides significantly greater results.Many also consider a proper moisturizer to be an essential piece for skin protection and fortification. 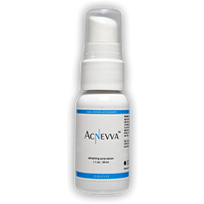 This particular kit also adds a spot treatment, which they claim will help you to get rid of problem zits within hours. There is no single product that can provide all of these results in one. How Does Boscia Clear Complexion Kit Work? All of the products in Boscia Clear Complexion Kit supposedly work together to cleanse, protect, and heal the skin. They suggest that you use the cleanser first, gently massaging it into the skin and then rinsing it away with warm water, followed by a thin layer of the tonic and then the moisturizer. 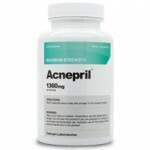 The treatment can be used as needed for problem zits. But what is the truth? Boscia Clear Complexion Kit has a number of essential oils, which can moisturize the skin while providing antibacterial, antiseptic, and other common benefits. But these essential oils do not fight acne. There is one major essential oil which can provide this effect. Tea tree oil is considered to be entirely irritant free, and it has been clinically proven to be as effective as benzoyl peroxide. Boscia Clear Complexion Kit does not have this ingredient, nor does it have any other active acne fighters. Can Boscia Clear Complexion Kit Cause Problems? 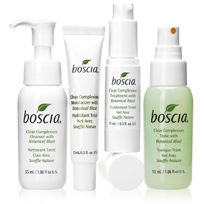 Boscia Clear Complexion Kit may not have parabens, triclosan, or other named irritants. But this does not mean that the Boscia Clear Complexion Kit products are safe. Boscia Clear Complexion Kit has other irritants such as titanium dioxide, an industrial grade chemical, which has been known to cause redness, irritation, peeling, dermatitis, and many other problems with the skin. But the Boscia Clear Complexion Kit has 4 pieces, which by nature has the potential to provide better results, they do not have the clinically proven ingredients or blends that are necessary for success. Boscia Clear Complexion Kit has quite a few irritants, and it can cause a number of possible side effects. But results are highly unlikely at best.